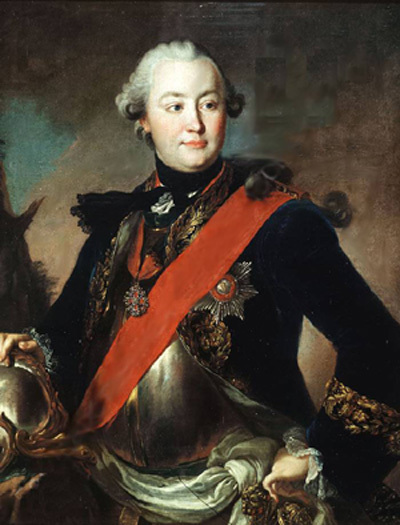 On February 14, 1769, Count Grigory Orlov submitted a Report of Conditions of Settlements on the Volga to the Czarina, Catherine II. The report includes statistics on population, crops, livestock, and buildings in each of the Crown colonies (those established directly by the Russian government) as well as the colonies established by the three private recruiters; Beauregard, le Roy, and Count de Bouff (de Boffe). This report was made 18 months after the first colonists arrived in Norka in August 1767. At the time of the report, Norka had the second largest number of families (212) with Katharinenstadt having the most (220). The report states that only 4 families in Norka were "unfit" for farming while Katharinenstadt had 88 families that were "unfit" for farming. In this case, "unfit" likely meant that these families were teachers, craftsmen, or had professions other than farming. It is also possible that it meant that certain families were physically unable to perform farming work due to age, disability, or the loss of family members. Count Grigory Orlov. Source: Wikimedia Commons. Norka had a total population of 772, with 400 males and 372 females. Again, Norka was the second largest colony in terms of total population with Katharinenstadt showing the largest population (812 people counted) of the newly settled colonies. Igor Pleve notes that Katharinenstadt was first formed as a small city and a cultural/trade center, and as a result, had a high percentage of non-farming residents. The number of livestock counted in Norka included 444 horses, 410 cows/calves, 40 oxen, 7 pigs, and 0 sheep. The number of pigs and sheep is much lower than what is reported for other colonies near Norka. For example, Messer had 456 sheep and 54 pigs for a total population of 329 people and Huck had 222 sheep and 11 pigs for a population of 319 people. It is likely that Norka relied on neighboring colonies for these types of livestock. Norka threshed 1,361 quarters* and 2 bushels of wheat (272.3 cubic meters) in the harvest of 1768 and there were two wheat mills. The report also shows that 417 quarters and 6 bushels of rye (83.5 cubic meters) were sown and there were 6 rye mills. Lastly, the report shows that 172 residences had been built and there were 118 barns and 168 horse stables in the colony. Pisarevsky, G.G., Studies on the History of Foreign Colonization in Russia in the 18th century.